Thirty-year-old Manhattan bachelor Ariel Zinsky is still recovering from his abusive childhood when he realizes no one -- including his few living relatives -- is truly interested in his narrative. While they numb themselves with the latest celebrity rehab story or the third-world atrocities replayed without ceasing on cable news, he sets out to write his autobiography as an exercise in his own self-medication, recasting himself as the hero in a coming-of-age story. Fans of A Confederacy of Dunces and The Perks of Being a Wallflower will relate to this tale of overcoming your childhood's traumas, and the world's indifference to them. Zinsky the Tall. Zinsky the Bald. Zinsky the Fascinating! What a character! Ariel Zinsky is flawed and determined. He is smart and single minded. He is funny, sometimes brutal, and almost always awkward. I had such a wonderful time reading this book. There were some difficult scenes, to be sure, but they were integral to the story. You won't always like what he does but I can promise that you will be rooting for him. Football and literature references are sprinkled throughout this book. As a fan of both of those I was thrilled. Most irresistible are the relationships that Zinsky is involved in. His ties to his mother and his bumbling ways with women struck me as natural and true. His relationship with his father is difficult, to say the least. Mochari has written a compelling tale about one young man's journey to manhood that reads like a modern classic. I can't wait to see what he does next. Ilan Mochari’s novel, Zinsky the Obscure, has earned rave reviews from Publishers Weekly, Kirkus Reviews, and Booklist. Ilan’s short stories have appeared in Keyhole, Stymie and Ruthie’s Club. 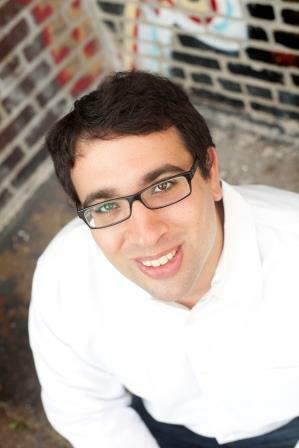 He is a contributor to Cognoscenti, the online magazine for Boston’s NPR News Station. He has a B.A. in English from Yale University. He used it to wait tables for nine years in the Boston area. To see the rest of the stops on this tour please visit TLC Book Tours. This sounds great! I did love Perks of Being a Wallflower when I read it years ago, so maybe this'll be perfect for me! I think you'd really like this one Sarah. I really hope that this book gets the attention that it deserves. Ah yes, my youngest is named Avery and people sometimes assume that she's a boy. Jennifer, thank you so much for reviewing -- and tweeting about -- my book! Thanks for visiting Ilan! It was my pleasure :) Wonderful book, can't wait to see what you have on tap for us! Isn't that the most fun? ;) I always get a big happy jolt out of that, lol. I really loved Perks, though Confederacy of Dunces left me annoyed... And hearing Comic Book Guy's voice in my inner monologue for weeks afterward... Would you say heavier Perks or heavier Dunces? Perks is a masterpiece ;) I haven't read Dunces! (Shhh, don't tell anyone!) I would say that this is a work that can't be compared to anything else I've read. I mean, I guess it's a BIT like Perks? Maybe? I'm zero help. Ignore me. Stop building up my TBR. Stop it! Ok, don't stop it. Well, this doesn't sound like something I'd usually pick up but the comparison to A Confederacy Of Dunces has totally caught my attention. That's my favourite! I'm always on the lookout for books that remind me of that! This one is seriously funny and moving. I do hope you pick it up Marie!! 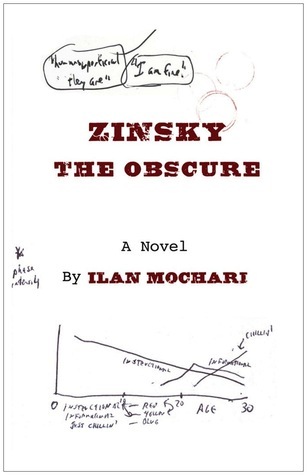 Zinsky sounds like an awesome character, I want to read this one. Yes you DO! One of the best characters I've come across! I thought this book sounded so great when it was first posted on TLC, I was hoping it would be one you would like so I could add it to the old TBR :) It sounds a little like The Unknows, which I just finished and loved, so I'll be keeping an eye out for it. I almost didn't say yes to review this one but I'm SO glad that I did! Definitely keep your eyes peeled for this one Shannon! Thanks, too, for posting the review on Amazon and Goodreads! This book sounds like so much fun! The Perks of Being a Wallflower was one of my favorite books in high school, so I'm definitely interested in this one! Sounds like a good one, different from all the usual plots out there. Glad you liked it. Oh my, I regret not accepting this one now... I think it kind of scared me. I'll put this on my TBR now, for sure! Oh rats! You'll definitely have to pick up a copy!! Wow, "reads like a modern classic" is a great recommendation for sure! I'm glad you enjoyed getting to know Zinsky! It was so good. SO GOOD. :) Thanks Heather, I appreciate that! I looooove when books have literary references, especially ones I recognize! Ditto :) It always gives me a little jolt for some reason, lol. I'm easily amused?